Our finds from the US fall apart into two main groups and one intermediate bridging the gap between both others. As I told you in Hawaii: better clean your lenses before you hit the road in the US. One group of warnings comes as text only. It's reassuring to see how rocks in mainland US seem much better under control. They come alone. 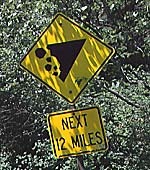 The warning mentions a single ROCK. Our find from Hawaii says ROCKS. They come in flocks if you may believe the panels. 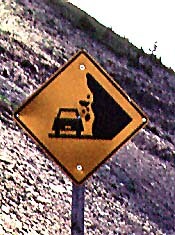 The Mt Rainier sign is most interesting. ROCK became plural and the text is enhanced with an elaborate picture. 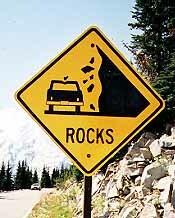 We recognize many (plural indeed) boulders and a car. Even the licence plate and rear lights are featured. 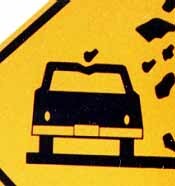 Rock-signs with vehicles are typical for several Latin-American countries (f.e. Chile, Argentina, Mexico) where sometimes even the driver is shown. It's probably the most complete design in its kind. But this panel shows one extra, and amazing, detail. One of the rocks hits the car. The next finds gradually evolve towards the second group with rocks only. We witness how first the text and the lights, then the licence plate and eventually also the car disappear. Entirely pictorial warning signs have the major advantage that people not able to read (or understand) the local language still can grab the meaning of the sign. Our samples show also a major drawback. The series of pictures below suggests that roadworkers together with the text lost an essential reference point. 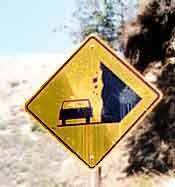 Our people on the field on several occasions run into rock-signs mounted upside down. 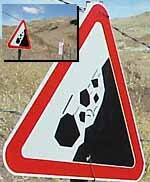 Find other wrongly fixed signs in: South Africa, Belgium and Indonesia. 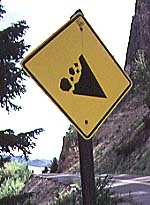 This warning sign posted by the city of Fremont (California) near a landslide area is based on the regular pictorial type (same cliff, same boulders) but shows a strong European influence in the design. We recognize the shape and the choice of colours and even the draglines suggesting considerable speed. Look closely and be surprised by a feature never seen before: a bouncing boulder. More speed and impact in Pakistan or Portugal.